One of the ways I like to fill the days when the kids are out of school is finding a fun craft for us to do together. 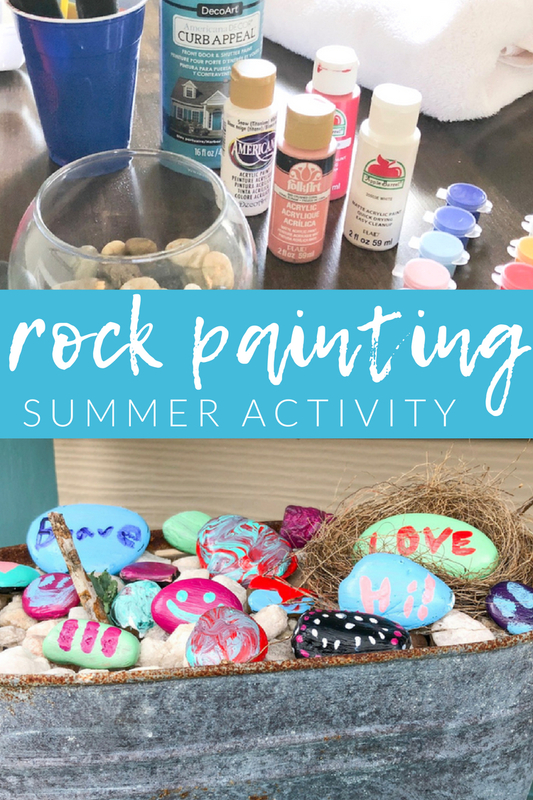 My kids love painting and this craft of painted rocks for kids is perfect! 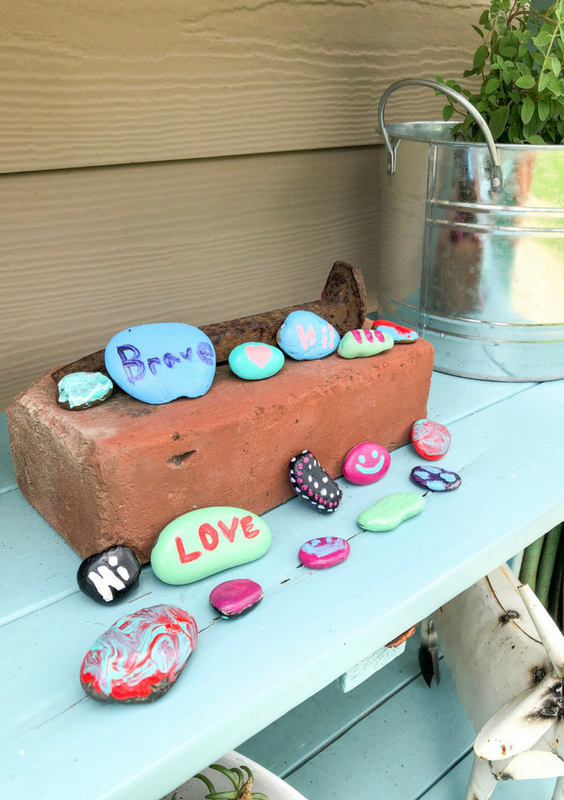 Lately there has been a local craze of painting rocks and hiding them around town for others to find. So why not add our own little creations to the mix? 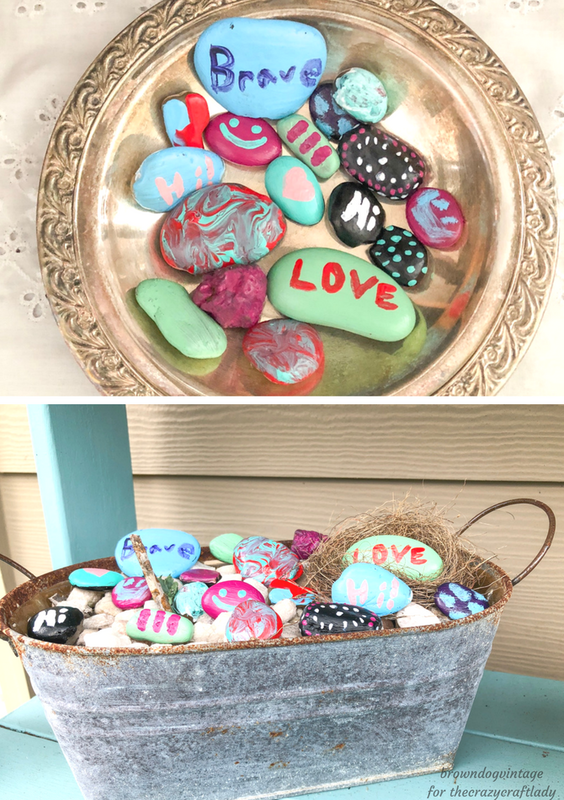 I’m so happy to be here sharing my painted rocks for The Crazy Craft Lady readers! 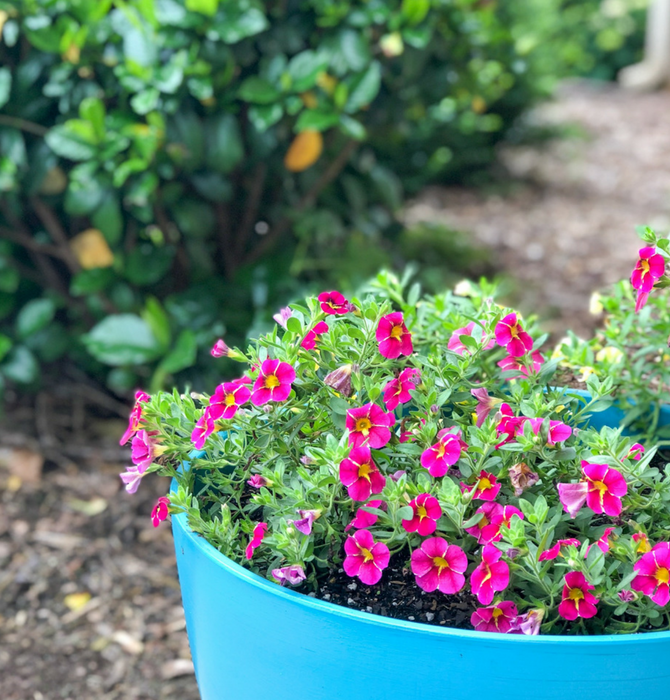 I’m Melissa from Brown Dog Vintage and I love simple DIY crafts like this planter makeover – a very easy DIY that won’t kill the budget! This is about as simple and budget friendly as it gets when it comes to crafting with kids. I gave my kids free range with this one. I didn’t pick colors or words or rocks – I let them choose it all. Now of course, if you are a perfectionist, you might want to grab your own rocks to perfectly paint. But I love to see what they come up with and letting them just be creative in their own ways. 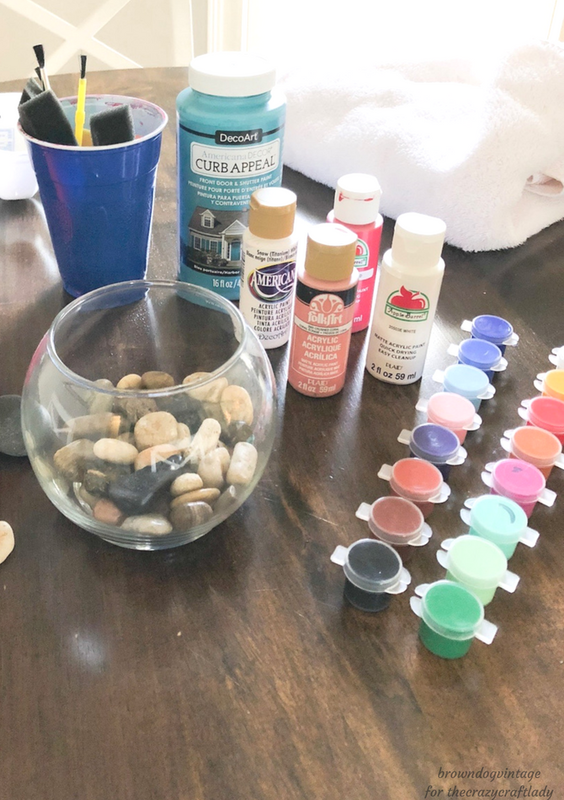 My kids are 7 and 10 and this craft was perfect for their ages, but really, as long as they can hold a paintbrush, they can do it! Make sure your rocks are clean and dry. I dug some out of my outdoor planters, some were collecting dust in a cabinet, and others were from the yard. Give them a good rinse and make sure they are dry before you paint. Pass out some brushes and paint to the kids. A good tip for painting with kids is to use leftover clean egg cartons. You can divvy up the paint in the egg holders for each kid. Paint one side of the rocks and let them dry. Flip and do the next. We actually did this over a few days, coming back to touch up or add a new color. 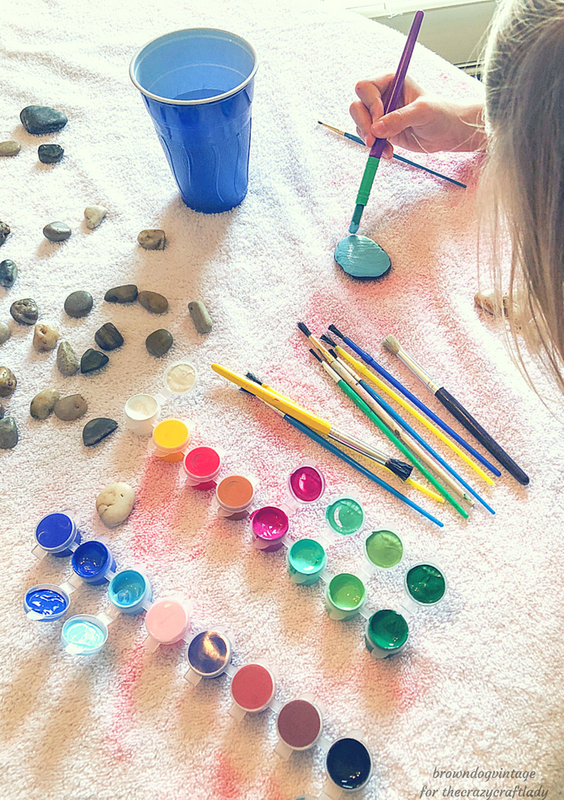 Teach the kiddos to dip the brushes in water between and then dry on the towel – this way you won’t be washing 100 brushes when it’s over! That’s it! Told you – easy and simple. 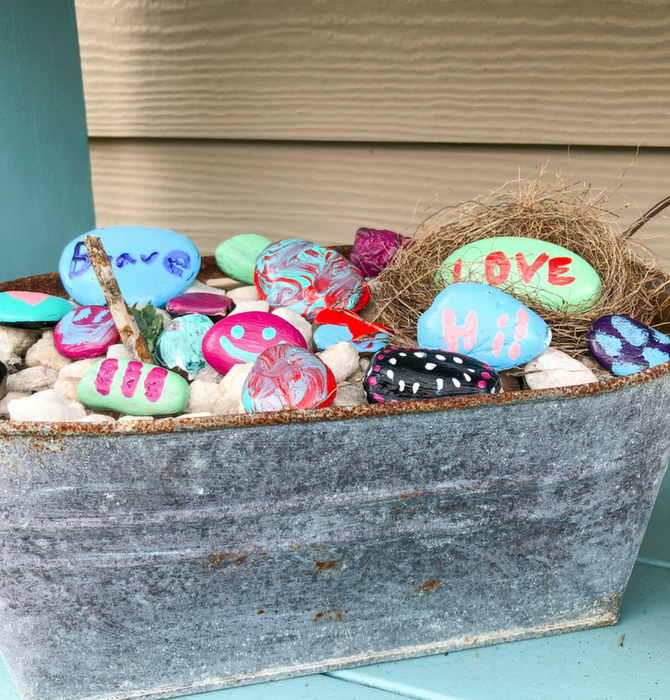 We are going to keep our rocks with us in the car and whenever we see a cool place to drop them in town, we’ll leave them for others to enjoy or pass on. I hope you enjoy this craft with the kids as much as we did. 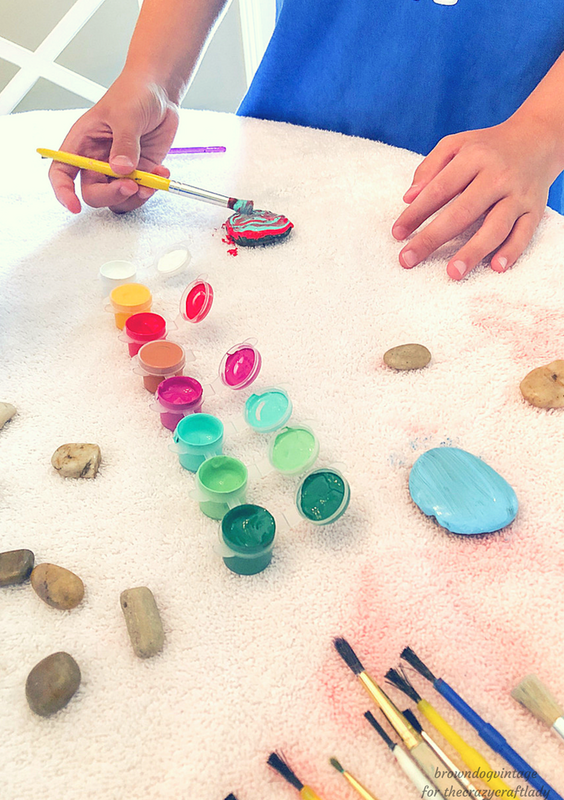 It was very cool to watch them come up with their own creations and I’m sure it’ll make someone smile to find a colorful rock around town! Another cool idea would be to paint several rocks in coordinating colors to add to a planter. I just revamped some of my old planters ( check them out here!) so I’m thinking a group of blue/green/white rocks would be gorgeous in those! 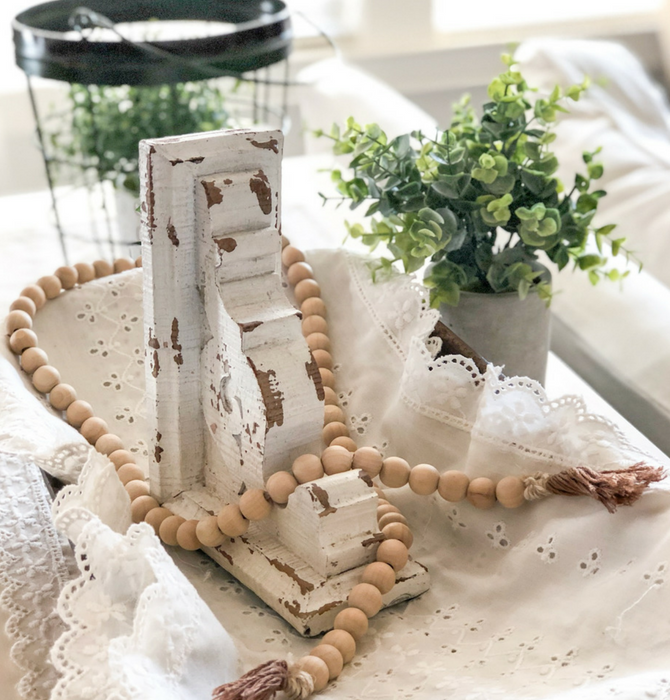 For another simple craft idea, be sure to check out my $8 wooden bead garland for a budget friendly DIY – I’m planning to make another one with my daughter and let her customize the beads for decorating her room! The kiddos can paint the beads and choose the thread color and you can help assemble!